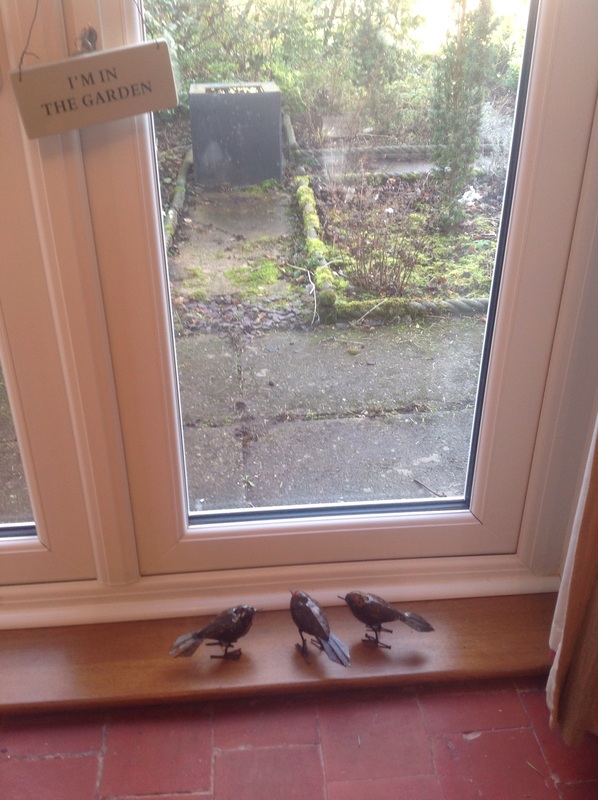 This entry was posted in Uncategorized and tagged Robins, Wordless Wednesday on February 25, 2015 by thelonggardenpath. I am joining in with Louise at Wellywoman and Sue at Backlane Notebook with their new meme about Scent in the Garden. Well, I couldn’t really avoid it! As anyone who follows my blog regularly will know, I have a passion for scent in the garden, especially scented shrubs and climbers. 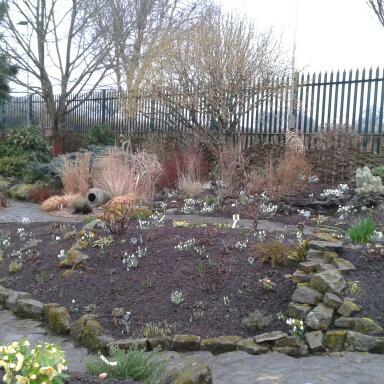 A scented shrub border was the first border we planted when we first moved here, over 20 years ago. It has been much modified since then and my shopping list shows no sign of diminishing. 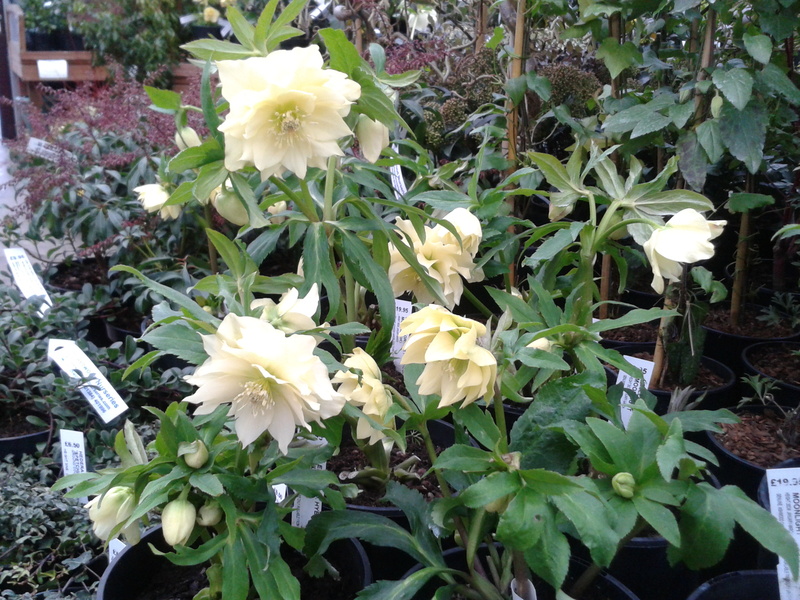 They are now spilling over into other planting areas in the garden – wherever is available! 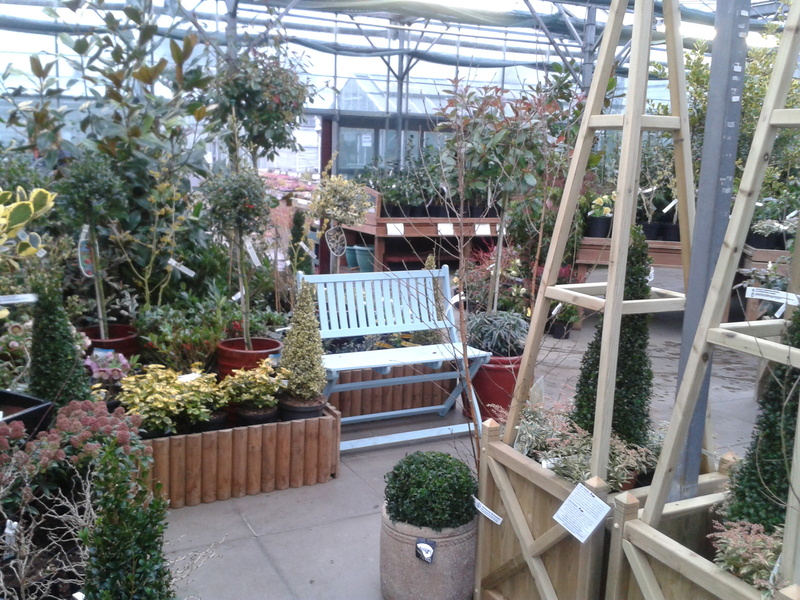 The aim is to have scented shrubs in flower all through the year – a continuous feast for the nasal senses! 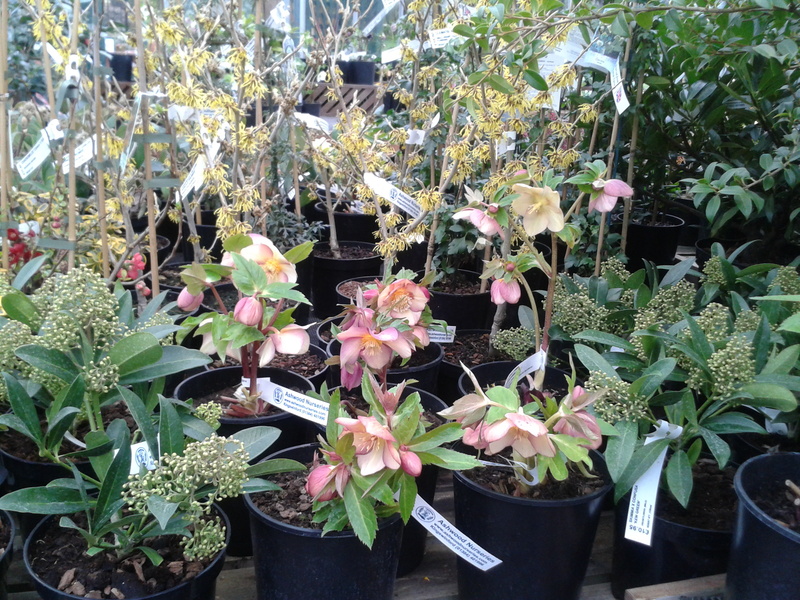 The winter months can be rich in scented shrubs, so many have obviously found their way into the border. That makes February a good month for me to start. I think the most delightful one at the moment is Chimomanthus praecox, pictured at the top of the post. This year, after an enforced bit of pruning resulting in a poor display last year, it has come out this winter with its best display yet. Sheer heaven, it was today, trying to photograph it. 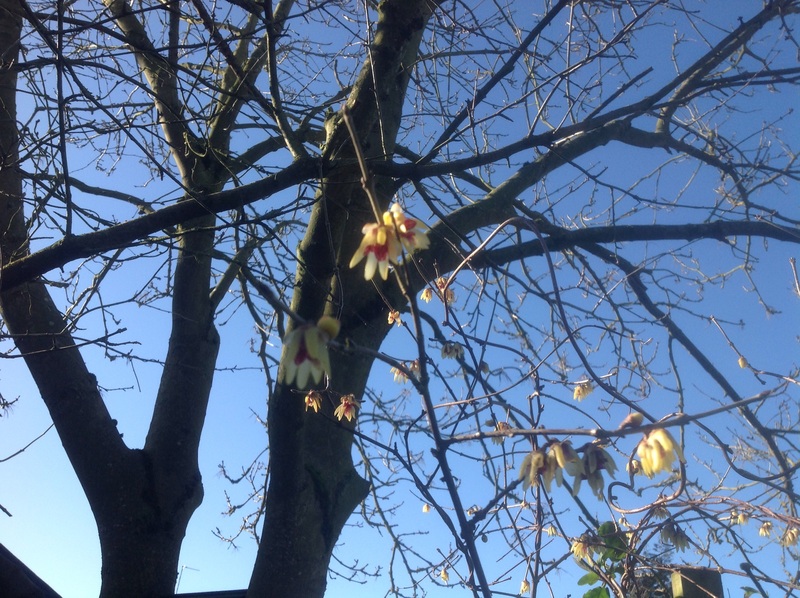 Looking up into those tiny yellow bells, with their purple “stained glass” centres, dotted against a brilliant, clear blue sky, was breathtaking, but difficult to capture. A gentle breath of wind insisted in moving the stems just at the point of focussing, leading to several blurred images. But the compensation was the gorgeous, spicy perfume wafting down. I’ve never noticed it so strong before. Often, I had to bury my nose in the blooms to appreciate it. Now, giving this a run for its money are the Sarcococcas or Christmas Box. We have several different species in the garden. I just love them! Their delicious honey scent is so strong that it follows you round the garden, often catching you unawares. 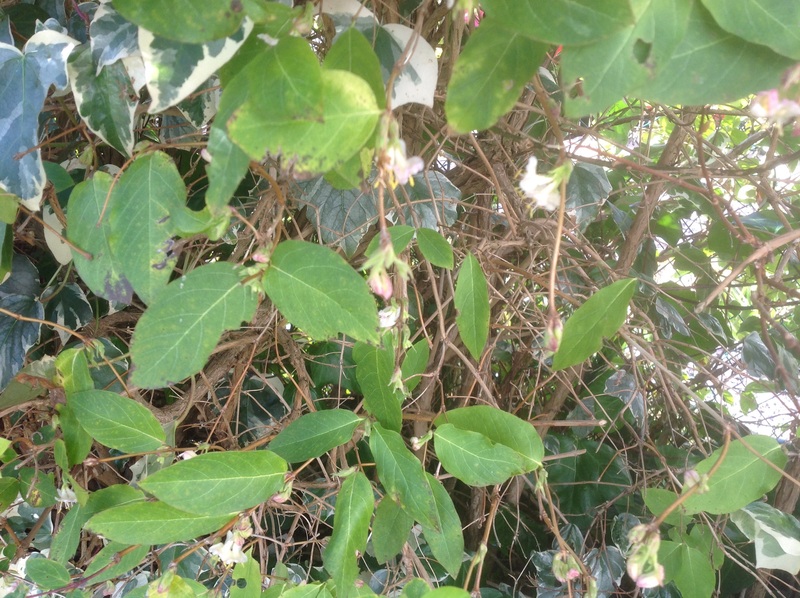 After all, the flowers are rather inconspicuous buried in the shiny, evergreen leaves. 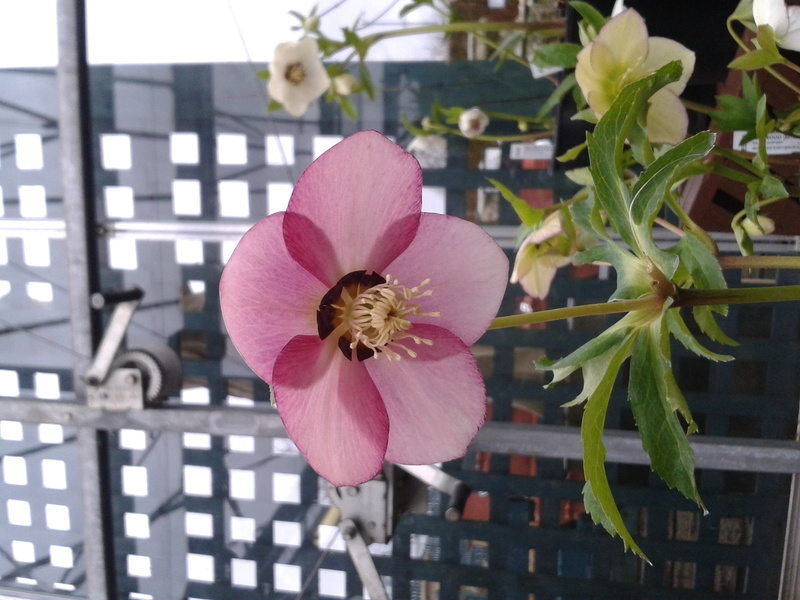 I think S. digyna has the prettiest flowers with their pink stalks. 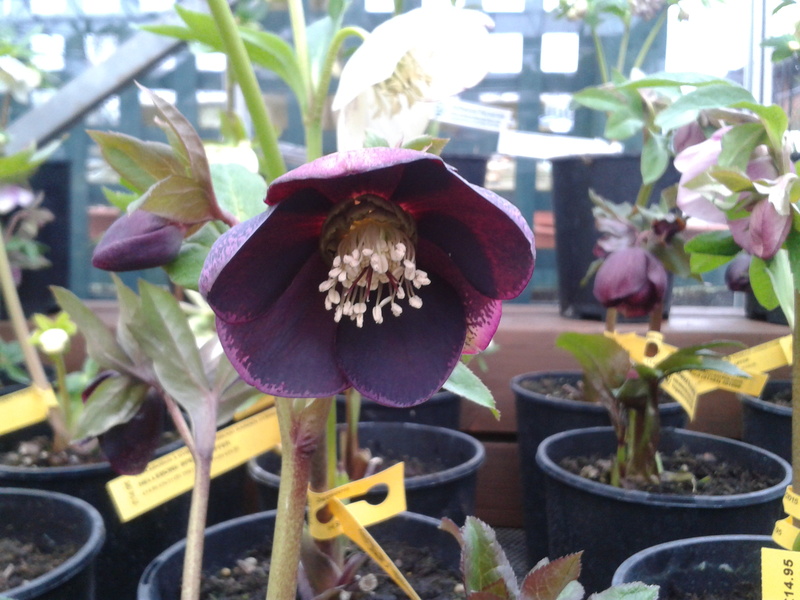 They are so easy to grow, and, being small and managable, they are easily slotted into any available space. 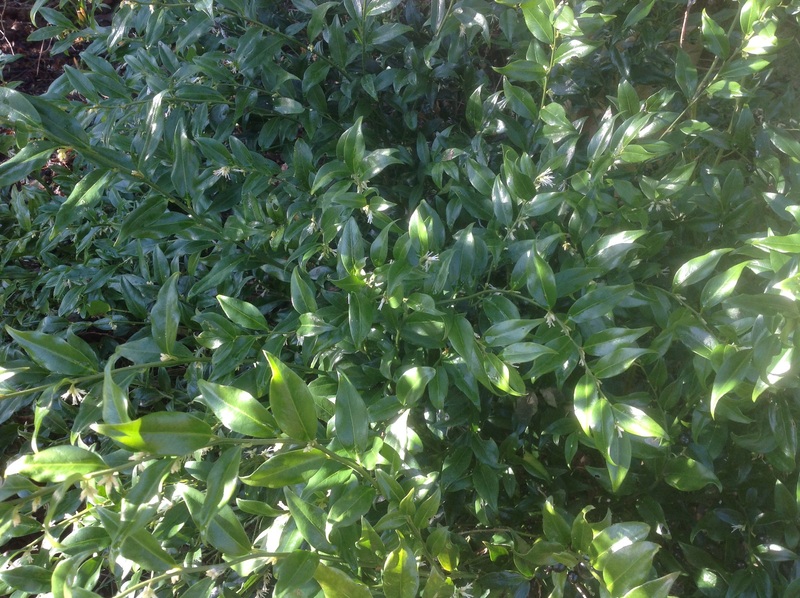 We have two others – Sarcococca orientalis and Sarcococca ruscifolia – but, as they were only planted last year, they have yet to flower significantly. 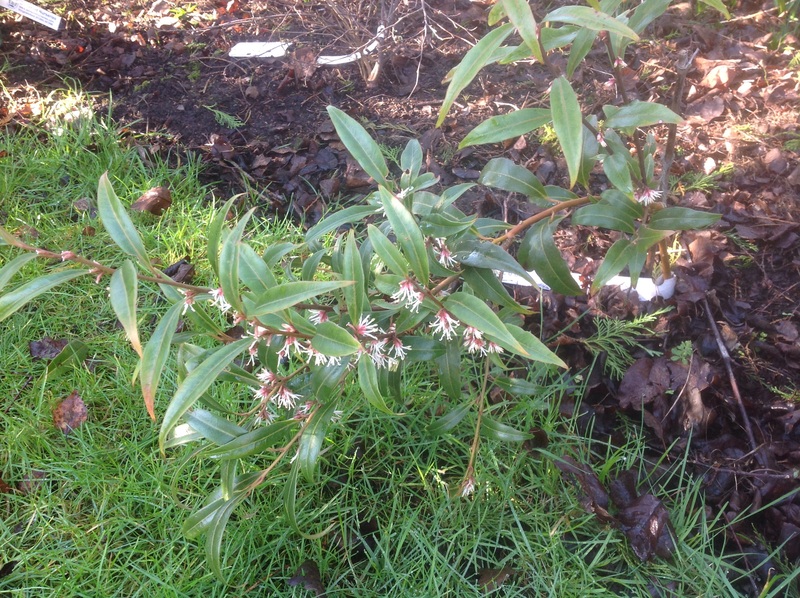 We also have a couple of winter flowering honeysuckles. This one resides in our front garden hedge, so unfortunately, can get a bit overlooked. 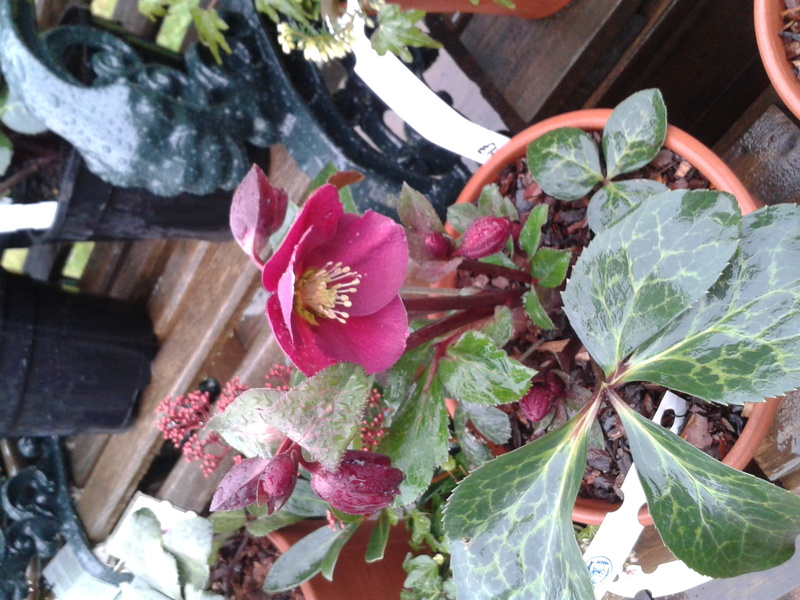 Shame, as its flowers have a lovely pink tinge. 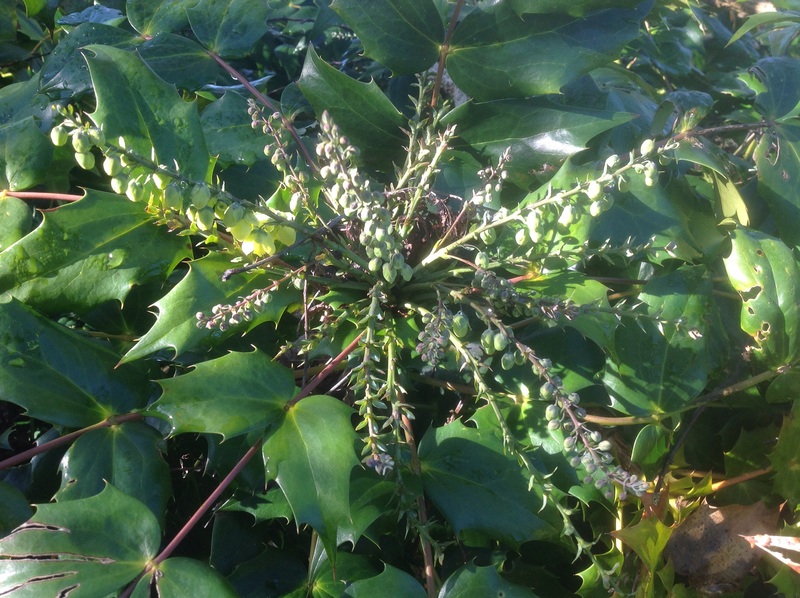 Our Mahonia japonica is still going strong. 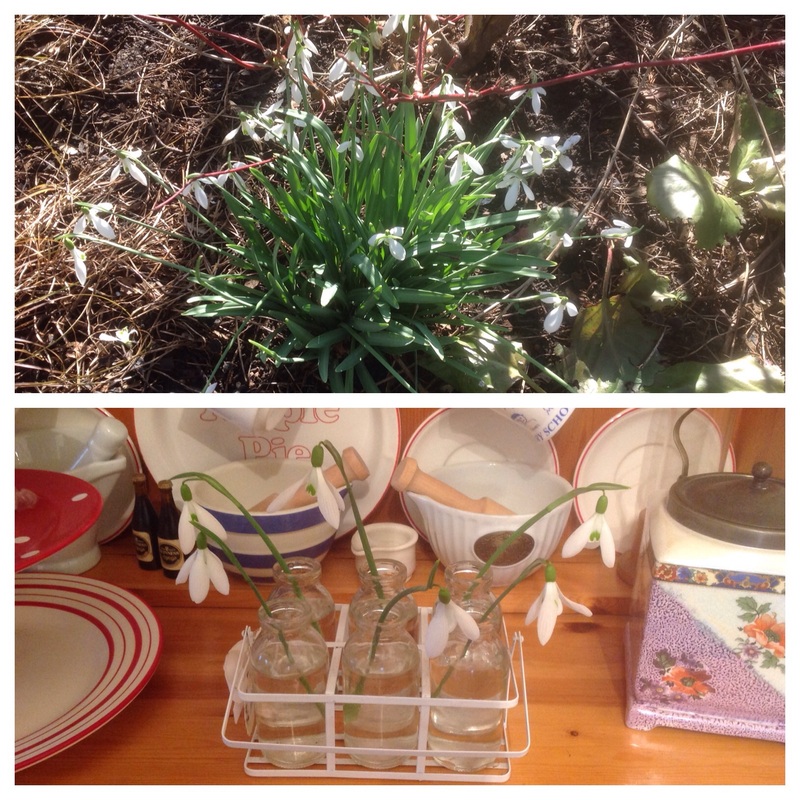 I thought these were the last of the blooms, but then I took a second look …. ….looks like it’s having a second wind, with what looks much like fresh new sprays just starting to open. And more lily-of-the-valley perfume! 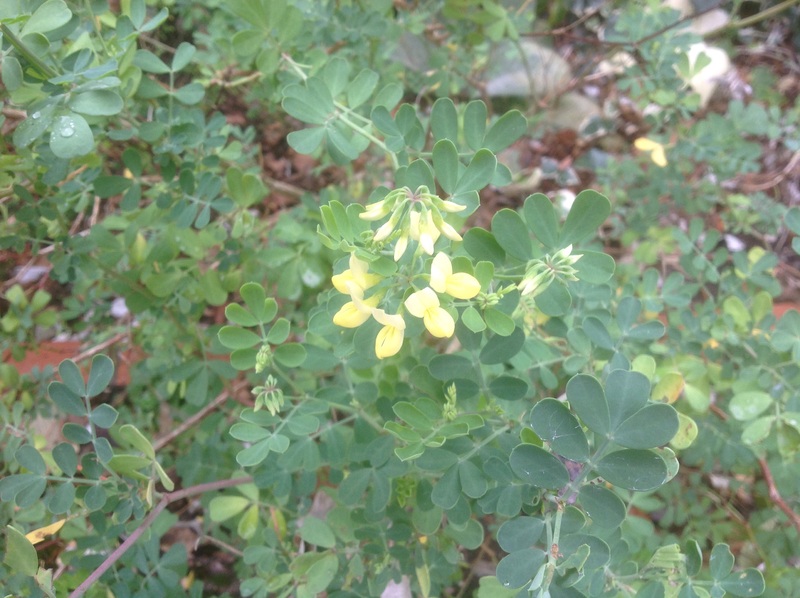 Meanwhile, still going strong in the front garden, is the Coronilla citrina, which has featured in several of my vases since the end of last year. It’s such a beauty, with its sweetly scented, lemon pea flowers and its pretty glaucous foliage. Am I allowed to include my latest purchase, even though it’s still in its pot? Well, it’s in the garden and giving me pleasure! So, I think, yes! 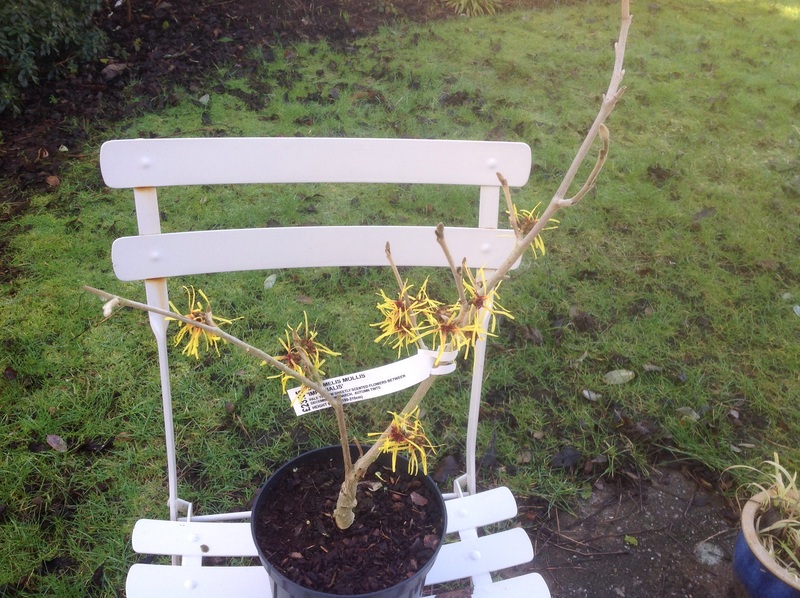 I’m determined to have a Hamamelis in the garden. 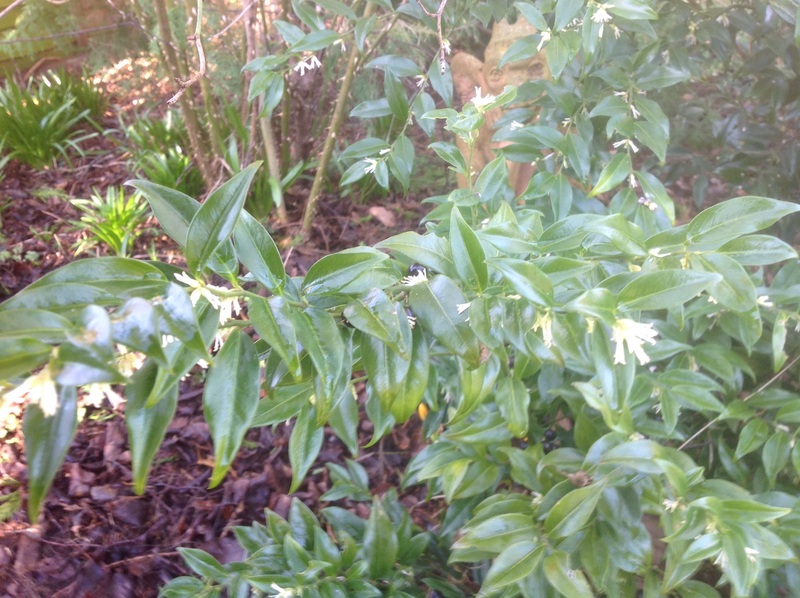 What self respecting scented winter garden could be without one? This one I bought just last week, and it will survive! 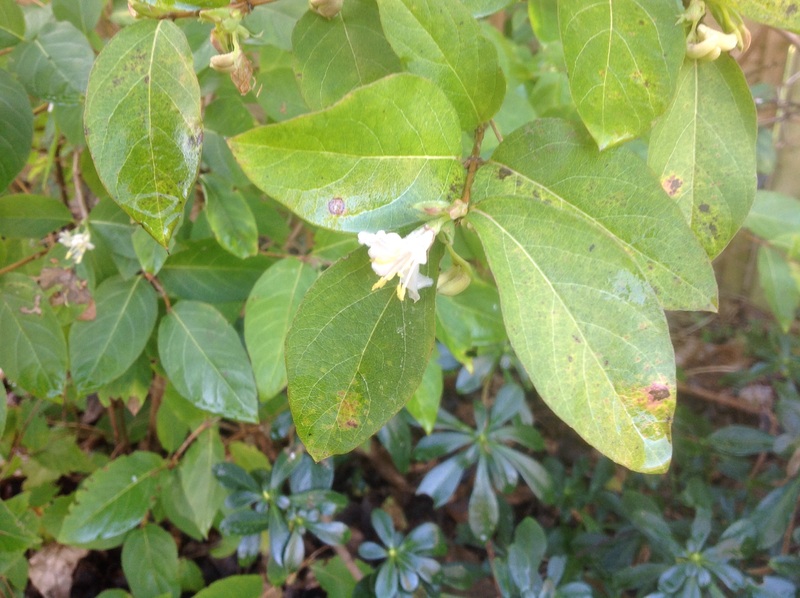 It has a really strong, heady scent with lemon, starry flowers. But it’s not all about shrubs. 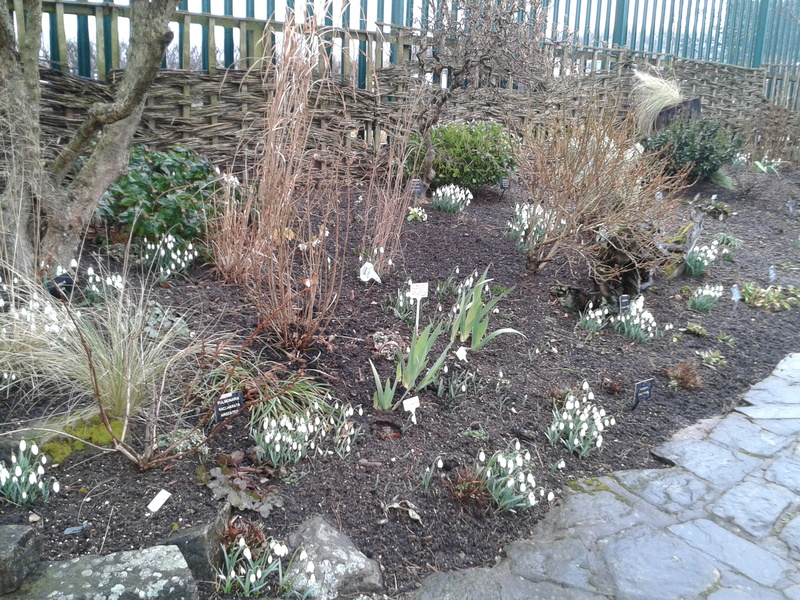 This is the Snowdrop season – the time for all Galanthophiles, and so here is my scented offering of Galanthus “S. Arnott”…. 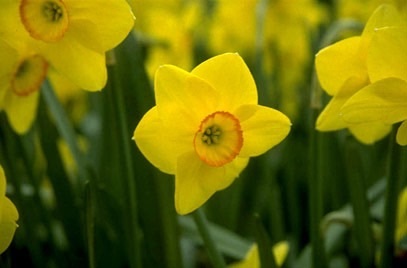 What perfumed delights do you have in your garden this month? 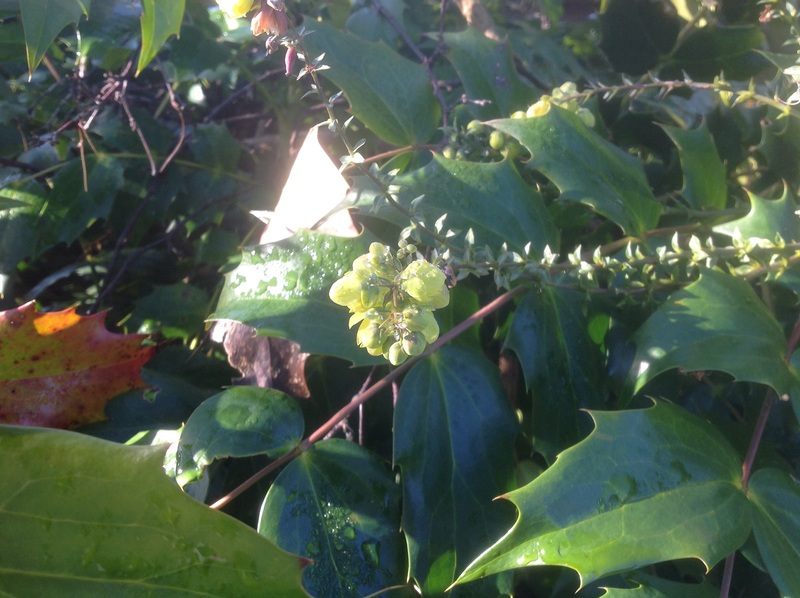 This entry was posted in The Scented Path and tagged Chimonanthus, Coronilla, Garden scent, Hamamellis, Lonicera, Mahonia, sarcococca, snowdrops on February 17, 2015 by thelonggardenpath. 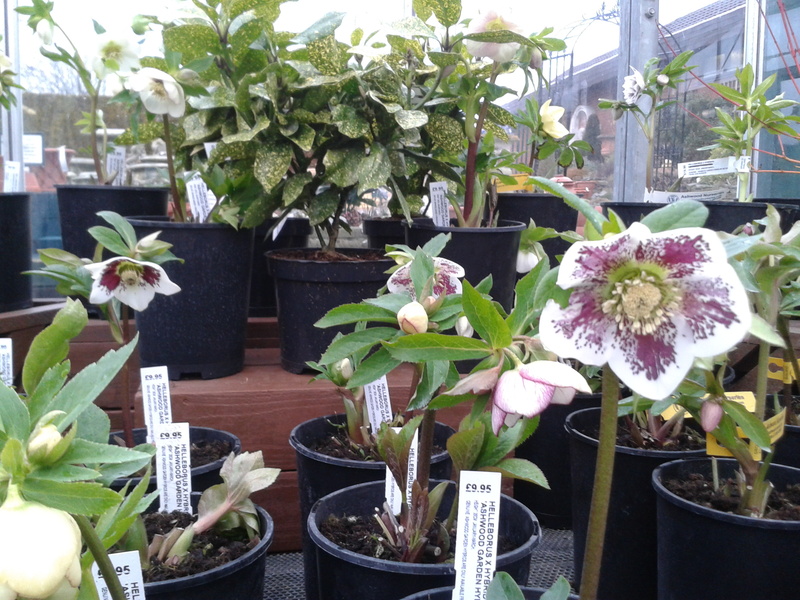 Today is Hellebore day at Ashwood Nursery, when you can view all their hellebores and have a tour of the nurseries. And, no, I have not joined in. Today is also a Six Nations day (and Valentine’s Day, but that is by the by!) and I don’t think Mr. 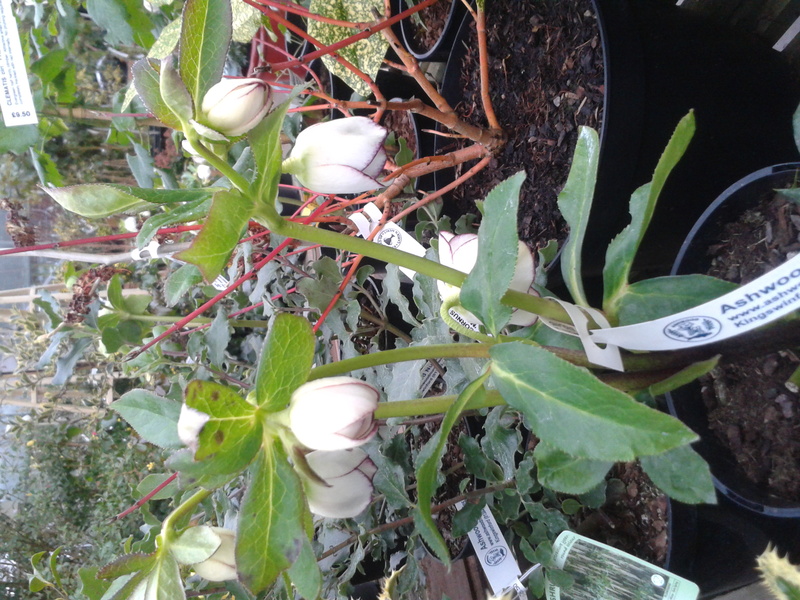 Chef would deem hellebores a suitable substitute for 30 men chasing an egg shaped ball around a pitch. To be fair, I would think twice, so I had my cake and ate it yesterday instead! I had a sneak preview! On a cold, wet miserable day, it was the perfect antidote. 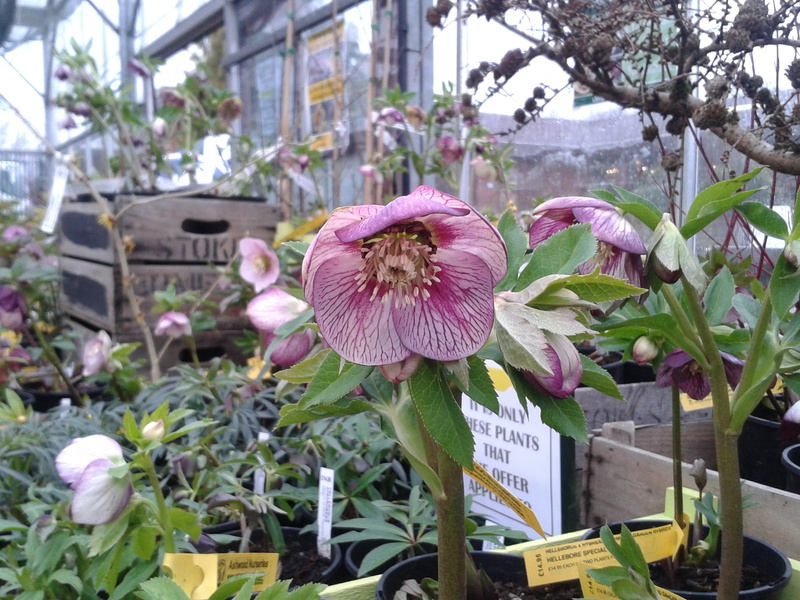 In the main glasshouse at the nursery, is a huge display dedicated to Winter in Bloom, and is the main display area for their Ashwood hybrid hellebores, along with lots of other lovely winter bloomers. They had masses of Camellias just waiting to burst forth. 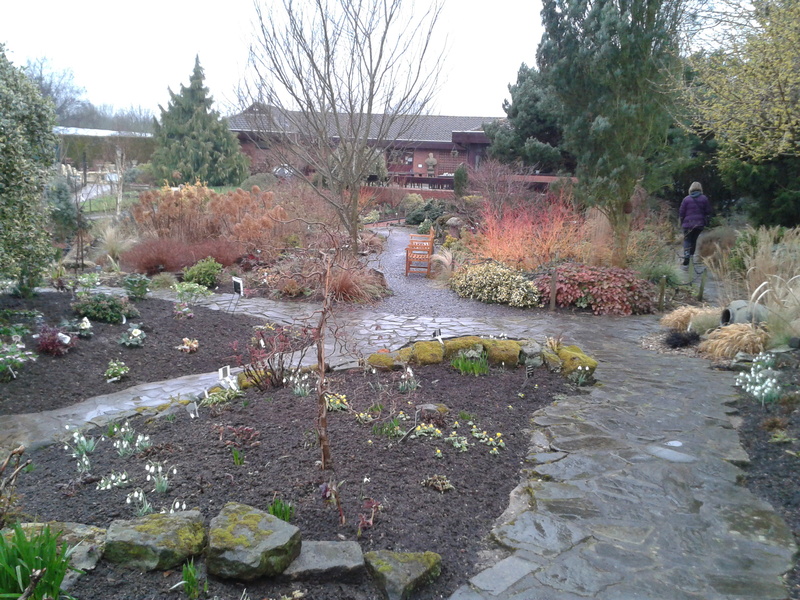 There were spicy scented Hamamelis, skimmias, winter flowering clematis. There were tiny, jewel-like cyclamens. 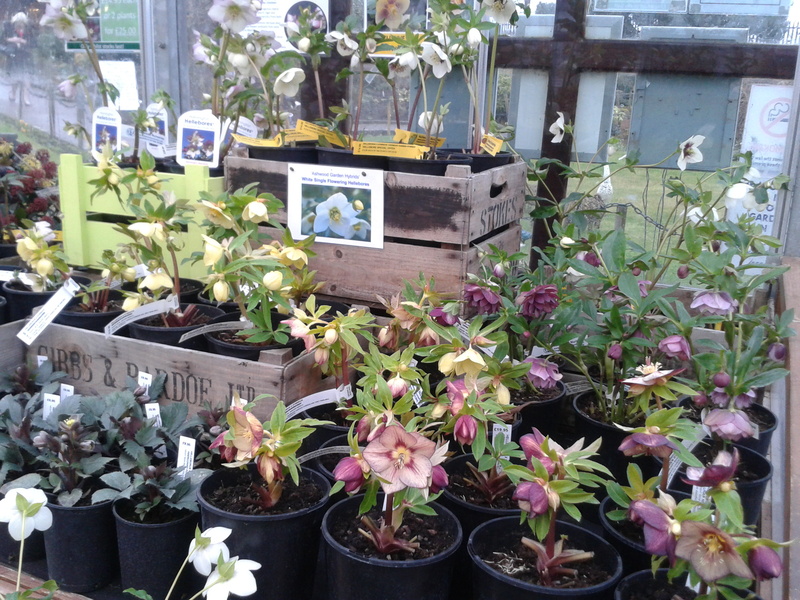 The highlight, of course, was the Hellebores. Every colour (almost) and marking imaginable! 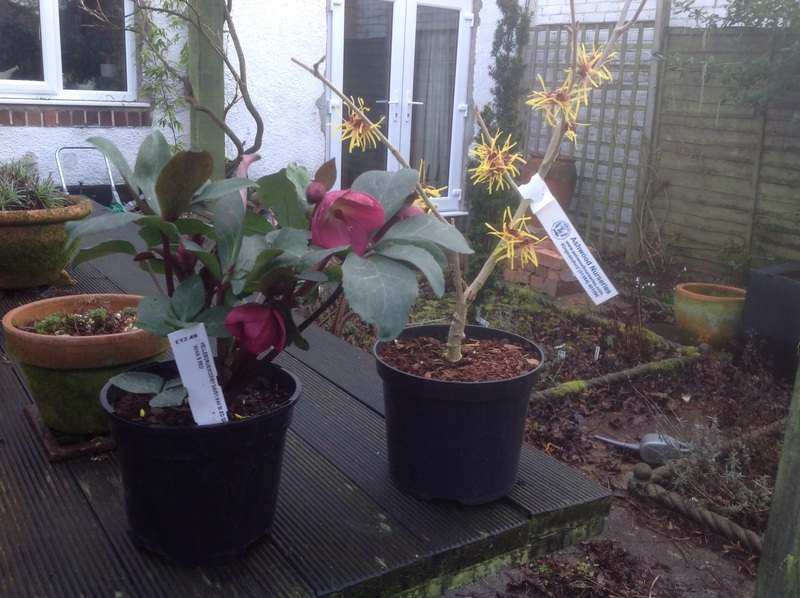 …or amongst other bright and cheerful winter planting. 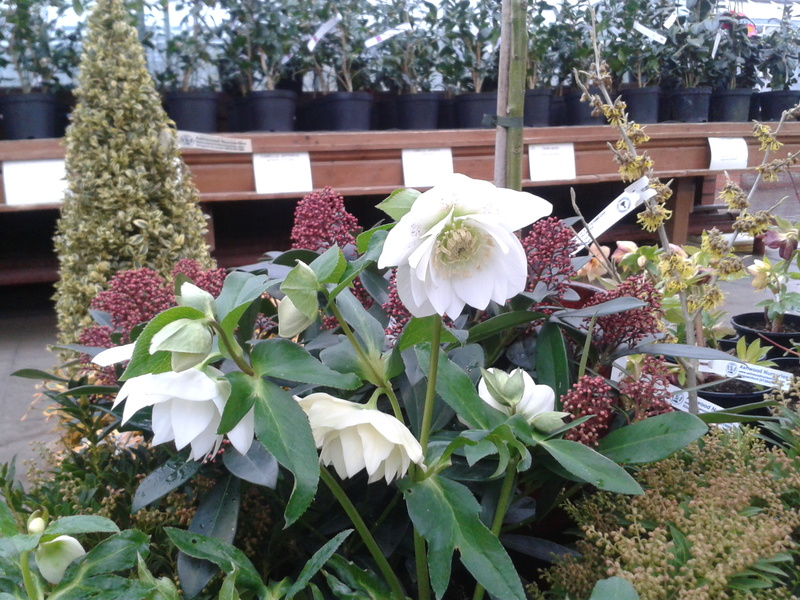 What a sunny display – with scent thrown in! Then there’s all the different markings. But the star for me was the red one I spotted last month. From the Rodney Davey marbled group called “Anna’s Red”. Isn’t she stunning? The show gardens were looking spot on, although some “refurb” seemed to be going on. And one for the Galanthophiles! Now, the big question – did I buy anything? Of course I did! I got the Hamamellis I have been wanting for such a long time. 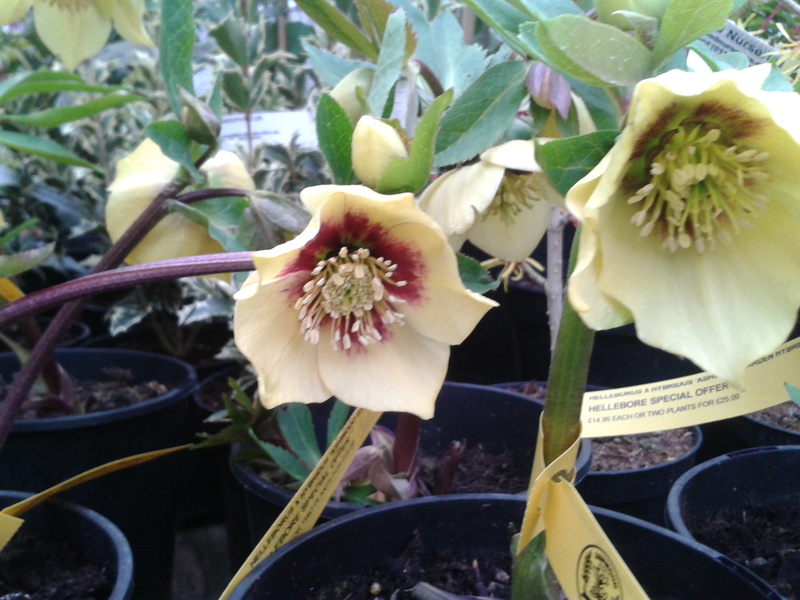 Hamamellis “Imperialis” with lemon yellow flowers, that are much longer than normal, giving a more impressive show. Complete with a sweet, heady scent too! And I just couldn’t come home without “Anna”! 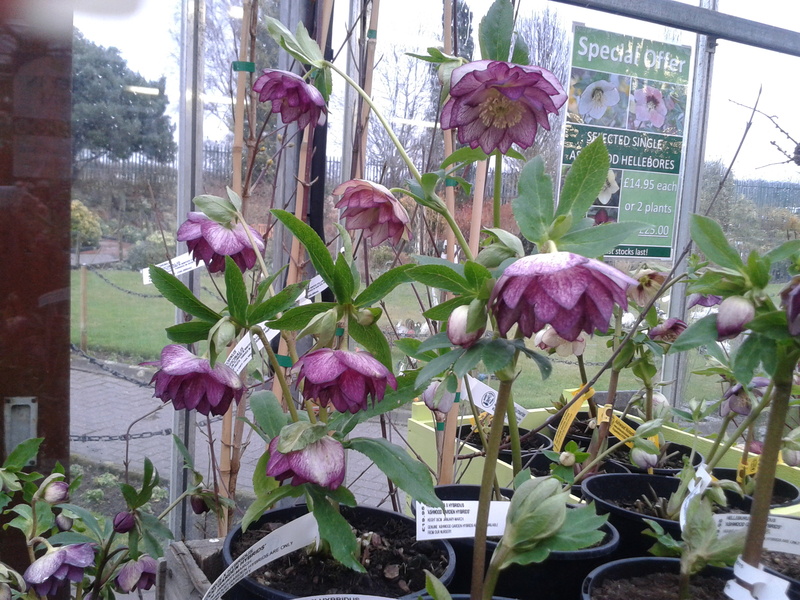 This entry was posted in I went to Ashwood and... and tagged Hamamellis, Hellebores, snowdrops on February 14, 2015 by thelonggardenpath. 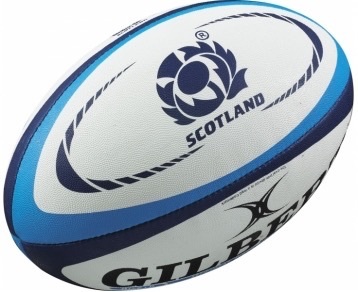 It’s the time of year when my attention turns to my other love – rugby union and the the start of the Six Nations. However, the garden is never far away from my thoughts, so, for a bit of fun, I thought I’d devise a plant collection in celebration. For anyone in the dark, this tournament takes place between the four home nations plus France and Italy. Our home teams all have horticultural emblems, which got me thinking! About coming up with a themed border. So, I make no apologies for starting with Scotland! 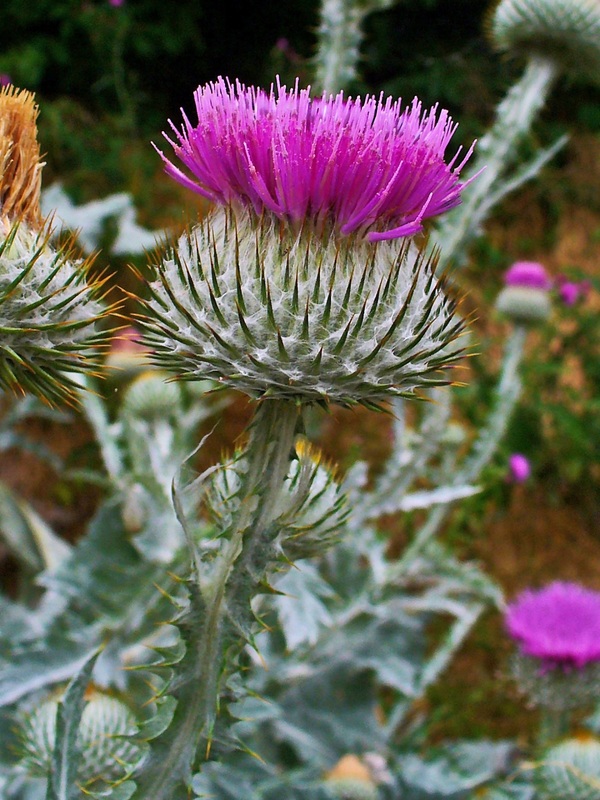 Obviously, the thistle. Onopordum acanthus – the Scots, or Cotton thistle. It’s a biennial that grows to 3 metres tall, with felted, spiny leaves and its characteristic purple tufts of flowers. Stunning and architectural! Closely followed, of course, by England. Aah! The Rose of England! So well loved by we gardeners. 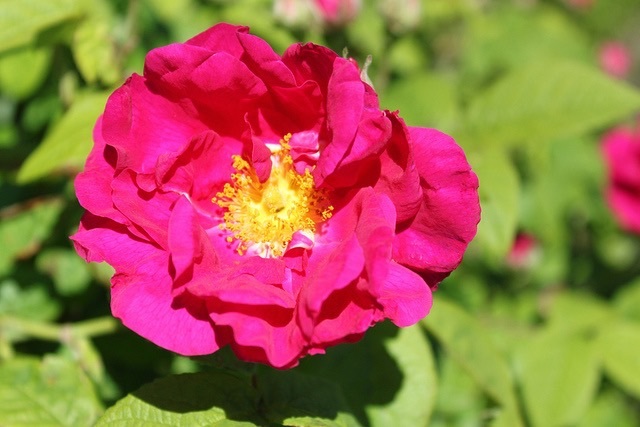 Rosa gallica officinalis – Apothecary’s rose or the Red rose of Lancaster. This, merged with the White Rose of Yorkshire, became the Tudor rose, which is the English national symbol. Ireland’s emblem is the shamrock. 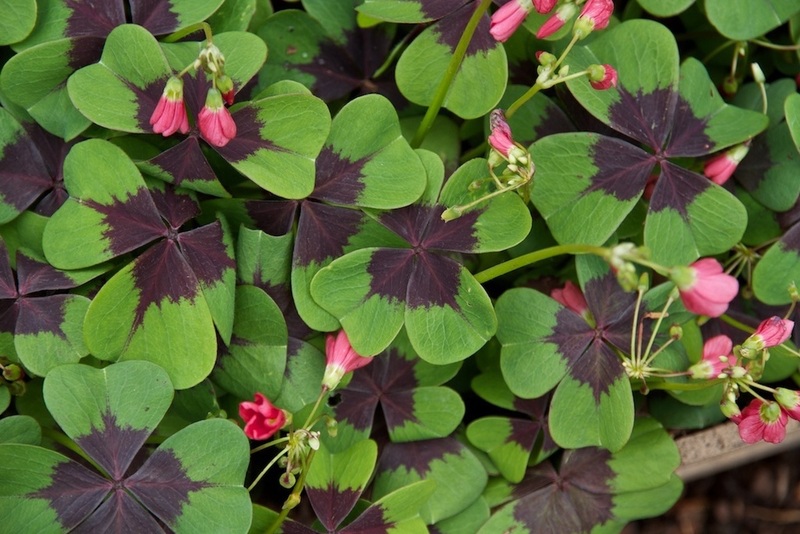 Basically clover, which is not overly desirable in the garden, being invasive and a bit of a pest, it may not be the best choice for a border, but within the same family, we have trifoliums and oxalis, some of which make worthy garden plants. Instead, I chose Oxalis tetraphylla “Iron Cross”, which, although not a clover (it has 4 leaves – lucky? ), is related. It has interesting purple splashed foliage with delicate sprays of red flowers. That’s the four home nations. Now it gets tricky! France and Italy don’t use botanical emblems for their teams – France uses a cockerel and Italy their national flag. So it’s down to me to decide for them! France is, for whatever reason, associated with garlic and onions. 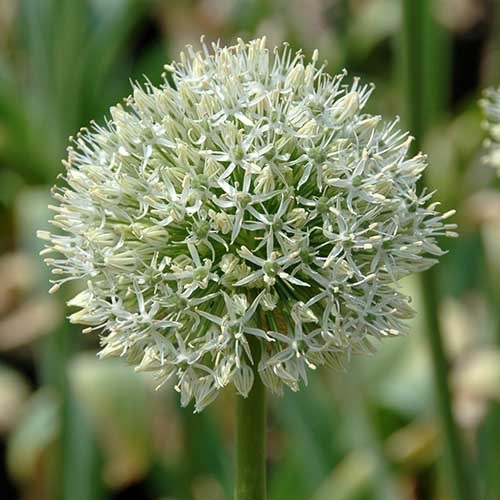 So I went for that emblem, choosing a more decorative member of the allium family. Which one? Why not “Mont Blanc” – France’s highest mountain? After all, they will have a mountain to climb! Here I struggled to come up with an appropriate emblem, so opted for Phlomis italica, just because I like it! 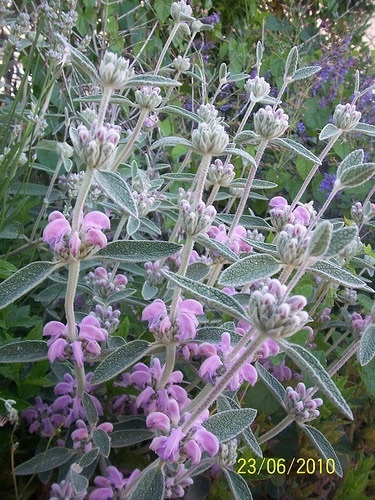 I saw this plant a.k.a Italian sage, on a fellow bloggers post and fell in love with its gorgeous soft pink flowers set against felted silvery green leaves. Of course, it’s now on my shopping list! But now that the montage is complete, I realise I haven’t done my homework properly. I have now realised a much more apt emblem for Italy – Bay or Laurel, (Lauris nobilis) used in Roman times to create wreaths to award to victors in sporting competitions. And it appears to be on their shirts under the flag! Oh, well, it’s done now! It’s just a bit of fun! They may not need them – and the Phlomis is prettier! So there we have it! 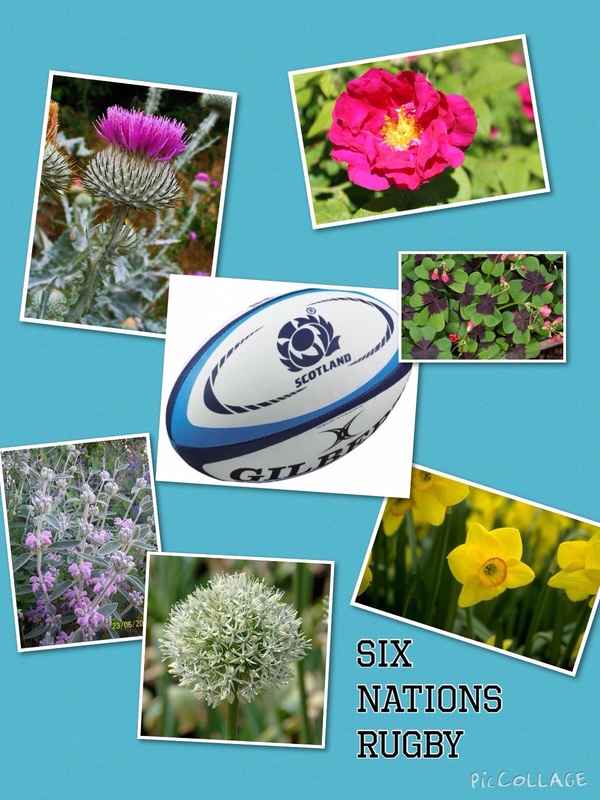 My garden homage to the Six Nations! All done from a purely biased point of view – no offence intended! This entry was posted in Uncategorized and tagged Allium, Daffodil, Laurel, Phlomis, Rose, rugby, Shamrock, Six nations, Thistle on February 8, 2015 by thelonggardenpath.